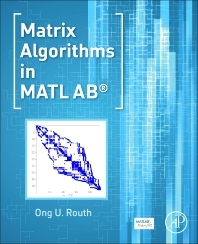 Matrix Algorithms in MATLAB focuses on the MATLAB code implementations of matrix algorithms. The MATLAB codes presented in the book are tested with thousands of runs of MATLAB randomly generated matrices, and the notation in the book follows the MATLAB style to ensure a smooth transition from formulation to the code, with MATLAB codes discussed in this book kept to within 100 lines for the sake of clarity. The book provides an overview and classification of the interrelations of various algorithms, as well as numerous examples to demonstrate code usage and the properties of the presented algorithms. Despite the wide availability of computer programs for matrix computations, it continues to be an active area of research and development. New applications, new algorithms, and improvements to old algorithms are constantly emerging. In 1989, Dr. Ong U. Routh studied computational mechanics and obtained a PhD degree in Tsinghua University, China. In 1991, he worked as a researcher in Osaka University, Japan, developing finite element software for the numerical simulation of sheet metal forming. Since 1999, he has conducted many industrial software projects for the analysis of structures and multi-bodies systems. His career interest is in the research and implementation of numerical algorithms that is directly used to solve engineering problems, such as finite element analysis, multi rigid bodies analysis, differential equations and matrix computations.